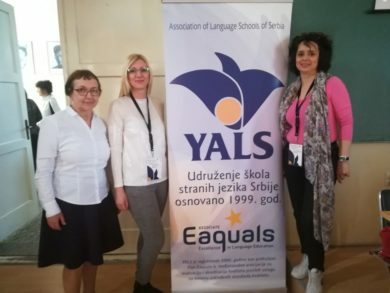 The first YALS Regional Conference organized in Nis gathered about 70 English teachers from the south of Serbia and two neighbouring countries. Our guests from North Macedonia and Bulgaria represented two Eaquals associate members, MAQS and OPTIMA. The whole day was dedicated to presenting the idea behind our association and that is the dedication to quality in the language services achieved through connections with Eaquals and especially continuous professional development. The Conference consisted of the introduction part informing the audience what YALS and Eaquals do and what their maim aims are, 4 practical workshops, one session presenting various extracurricular activities from several YALS schools and poster presentations displayed in the venue hall. 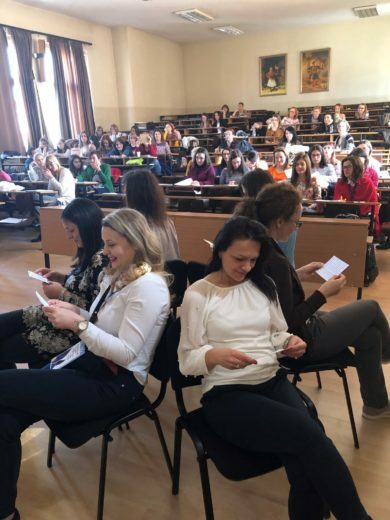 The workshops entitled Global issues, Humour is no laughing matter, Enlivening learning with LEGO, Classroom in motion: Fun activities for kinaesthetic learners offered fresh ideas created by YALS teachers. In the last part of the Conference, entitled YALS Best Practices, the participants were given insight into additional activities YALS schools organise for their learners, such as Cooking Academy, TEDEd club, Storytelling, School Trip Language Project, Digital Storytelling and Book Corner. Eleven YALS teachers had the chance to share their expertise and their successful activities with colleagues. Having analysed the evaluation forms, we can conclude the Conference was a success and it fulfilled its aims as we managed to present YALS and Eaquals, empowered English language teachers with new ideas and connected to members of alike associations from the neighbouring countries. Click here to access the presentations and photo albums on the YALS website.